Currently, the media is marking 10 years of a crisis they didn’t see coming in the first place and questioning experts they did not listen to at the time (at best) or who became experts after its advent (at worst). Hence, it’s time to recall that LEAP/E2020 and the GEAB were among the very few who first forecasted the crisis – in the midst of complete media indifference – with a degree of detail that was barely equalled. Every month during the two and a half years that separated LEAP’s early anticipations from the collapse of Lehman Brothers, the GEAB put down one by one the development stages of the crisis. If the European media system was unable to focus on what a small independent European think tank without financial expertise was saying, we cannot say the same of people like you who are still reading us today. The complete viral success of the online GEAB on a global scale is a case study that still needs to be analysed. In any case, it has proved the superiority of the intelligence of individuals over that of organisations. This is how the first GEAB issue opened in January 2006. 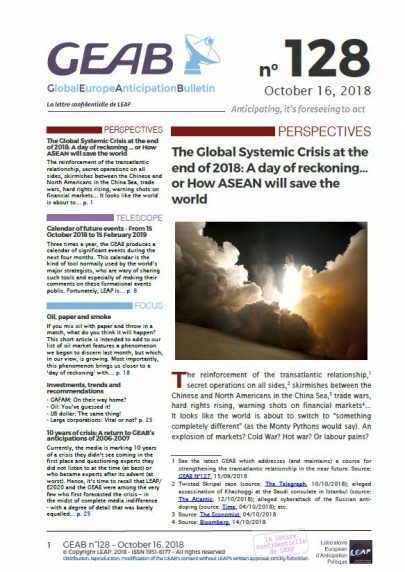 Right from the very first GEAB bulletins, our researchers formulated and theorised about the ‘global systemic crisis’ that is still ongoing today. Indeed, if the great feat of this team is to have anticipated the so-called subprime crisis, it also realised very quickly that it would not be one of the usual, regular financial crises that are part of the economic cycle, but a transformation phenomenon of a scale comparable to that induced by the great geographical discoveries of the Renaissance. As you can read in the excerpt above, we saw the onset of this crisis earlier than it actually occurred. Today 9th August 2007 is considered the ‘kick-off’ of the subprime crisis. That day, BNP Paribas froze the withdrawals of three of its investment funds. Accordingly, the bank refused to value its assets because it admitted that they were no longer exchangeable on the financial markets. Therefore, the temporal gap between the anticipated date and reality was one year and four months. On the scale of a crisis which has already lasted for almost a decade and which it is hard to know if we are really out of, this remains quite precise. In the same edition, the following question was asked: ‘Is the world about to discover, like it did with the Soviet figures after the Fall of Iron Curtain, that US statistics were in fact phoney?’ The answer to this question was provided in 2008 and the situation proved subtler than in the case of the USSR. It was not the North American state that rigged the economic statistics, but the rating agencies. As was clearly shown in Charles Ferguson’s Inside Job documentary, all the US financial institutions which went bankrupt or were rescued by the government during this period had excellent ratings (ranging from A2 to AAA). Finally, it was also on that date that the LEAP/E2020 teams spoke of the risk of an explosion of the housing bubble with potentially catastrophic repercussions on the US economy. As we know today, of course, that risk materialised and was the main trigger of the generalised global crisis. Again, the team imperfectly gauged how long it would take before those bankruptcies were officially acknowledged and triggered, anticipating it would be shorter. The first major US fund to declare bankruptcy would be Sentinel Management Group, on 17th August 2007. But in the following thirteen months and even after, many banks in the United States as well as in Europe were actually declared bankrupt or were rescued by states or central banks just before suffering the same fate. We have here a perfect description of what the subprime crisis would consist of several months before it was irrevocably unleashed and well before most observers were aware of it. In the bulletin of February 2007, LEAP/E2020 put down nine ‘direct consequences of this crisis’ certain to come together in April 2007. Not everything turned out exactly as anticipated; some elements were overestimated, like the Chinese sale of the dollar and (if so) the increase of the China/US trade conflict, but there were at least two which were perfectly anticipated despite, once again, an estimate just short of the realisation time. These were the ‘entry into recession of the US economy in April 2007’ and the ‘sharp decline of the US dollar against the euro, the Yuan and the Yen’. The North American economy was indeed the first of the OECD economies to enter recession in December 2007. The dollar, meanwhile, actually fell against the euro throughout 2007 to reach a historical low of €1 = $1.48. During 2007, our research team produced multiple anticipations of this kind. Another telling example was the anticipation of the increase in the barrel price of oil. In GEAB No.14 (April 2007), it is stated that the price of a barrel would reach $100 in June 2007, an anticipation which was realised on 2nd January 2008 (but, as we will see later, the resilience of the system is well-known, and, therefore, that of repelling such events with devastating aftereffects). It is now accepted that CDS and CDO (Collateralised Debt Obligation) played a key role in the aggravation of the crisis. First, on the American continent in 2008 and 2009, following the fall of Lehman Brothers, who had been exchanging large quantities with the AIG insurer, which the US State had to vouch for not to worsen an already chaotic situation, but also in the European sovereign debt crisis in the early 2010s, at a time when the price of CDS had a systemic impact on the price of sovereign debt. 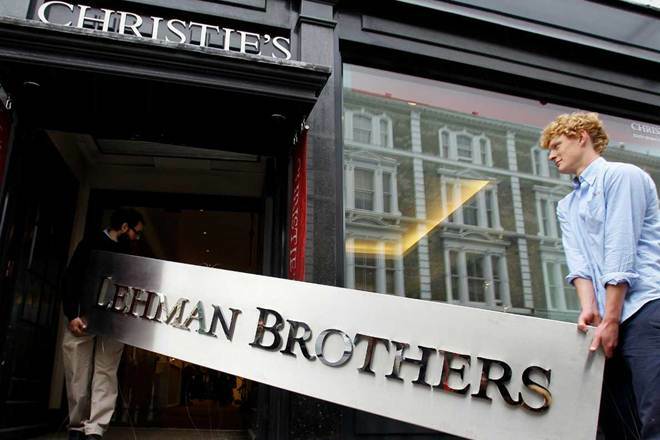 Everyone remembers it without difficulty: The climax of the US subprime crisis was the bankruptcy of the Lehman Brothers bank, which could have impacted on many others, starting with the AIG insurer, if the US state had not intervened after seeing the chaos caused by the bankruptcy of Lehman. It is this event that marks the ‘anniversary’ of the crisis in 2018 and that led us to offer this retrospective study in the first place. On 12th and 13th September 2006, six months after GEAB’s first anticipations, the IMF released two successive reports, the Report on Global Financial Stability and the World Economic Outlook. These two reports corroborated the forecasts published in the GEAB since the beginning of 2006 on the bursting of the US housing bubble, the economic recession in this country, the interest rate dilemma for the Fed, the strong and lasting decline of the dollar, as well as the sustained rise in the oil price, to the point that the GEAB was then able to compare point by point its own analyses and the warnings of the IMF in the September 2006 issue (GEAB No.7). Hence, we can see that LEAP/E2020’s forecasts published in the GEAB pages were accurate, complete and pioneering, since they covered all aspects of the crisis, over the entire duration of its development and they were issued before other similar forecasts. The first three phases went according to our anticipations. The first did occur in the first half of 2006, the second during the following 12 months (that is to say up to the summer of 2007) and, finally, the third during the last quarter of 2007 and the year 2008, along with the spread of the crisis and the series of bankruptcies leading up to that of Lehman Brothers; the best known on account of being the most spectacular. The fourth is still ongoing. What the LEAP teams underestimated was the resilience of the system and its ability to redeem itself through money creation. In January 2006, the first GEAB issue compared the Dollar Wall to the Berlin Wall and announced its inevitable collapse as a logical extension of the Iron Curtain. Ten years later, the dollar appears to have remained the international reference currency and is still the main instrument of US economic and financial hegemony. That said, the GEAB has continued to anticipate the stages of erosion of its supremacy, related particularly to the emergence of the Yuan zone, the structural fragility of the petrodollar and the political will to exit that trap (quite similar to that expressed by Gorbachev during his term). And, in this issue, we anticipate the final stages of this process for the end of the year. Another important aspect of the 2006 anticipations which never occurred is the Iran/USA military clash. The conflict has remained stale, taking the form of sanctions and giving rise to a gradual transfer of responsibility to Saudi Arabia. Be that as it may, the Iranian issue remains central to the reorganisation of the world, as consistently shown within the GEAB pages year after year. Therefore, we believe that the global trend drawn up in the GEAB at the beginning of 2006 is still at work, even if its progress is much longer than we had previously imagined. Firstly, what they are looking at is not a ‘new crisis’, but the end of the crisis of 2008. Secondly, since their announcements no longer have the same degree of confidentiality as those of 2006/2008, they have a direct impact on the innumerable possible workarounds, to the point where most of them can be judged political or even manipulatory (when they emerge from gigantic organisations with biased interests, like JPMorgan Chase). Finally, the world today is of infinitely greater complexity than the world of 2008 and the real economic dynamics are essentially outside the system of Western stock markets – a system which (as everyone agrees) is more than ever disconnected from reality. The GEAB has always been something of a lone wolf. Almost alone in 2006 in announcing a huge crisis, it remains almost alone today in anticipating the stages of the old world’s disappearance and of the construction of a new one. An imperfect and challenging world, not reduced to the hysterical figures of the financial markets, as we have seen again in this issue, with our analysis of the virtualisation phenomenon of oil prices. 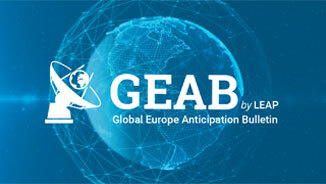 Using its political anticipation method, which has continued to demonstrate its efficiency for almost 13 years, the GEAB keeps on shedding light on the landscape that each of us must have in mind when putting forward strategies for the construction of the future.